Andhra Pradesh is one of the 29 states of India, situated on the southeastern coast of the country. The state is the eighth largest state in India covering an area of 160,205 km2 (61,855 sq mi). As per 2011 census of India, the state is tenth largest by population with 49,386,799 inhabitants. 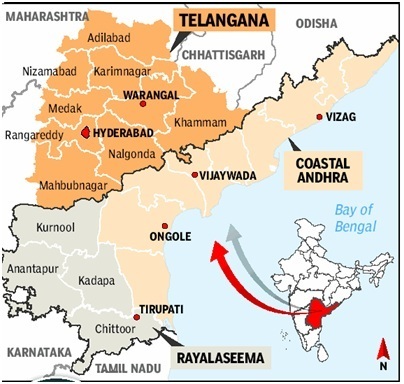 On 2 June 2014, the North-Western portion of the state was bifurcated to form a new state of Telangana. Hyderabad will remain the de jure capital of both Andhra Pradesh and Telangana states for not exceeding 10 years. Andhra Pradesh is one of the 29 states of India, situated on the south-eastern coast of the country. The state is the eighth largest state in India covering an area of 160,205 km2 2 (61,855 sq. mi). As per 2011 census of India, the state is tenth largest by population with 49,386,799 inhabitants. On 2 June 2014, the north-western portion of the state was bifurcated to form a new state of Telangana. In accordance with the Andhra Pradesh Reorganisation Act, 2014, Hyderabad will remain the de jure capital of both Andhra Pradesh and Telangana states for not exceeding 10 years. 1 November 1956; 59 years ago (re-organised for 1st time). Summer temperature ranging between 20 °C and 41 °C. State has a long coastal belt the winters are not very cold. Visakhapatnam Airport is the only airport in the state with international connectivity. Ugadi is celebrated as the Telugu New Year. Makara Sankranti, Dasara, Vinayaka Chaviti, Deepavali, Vasantotsavam, Maha Shivaratri, Attla Taddi etc. Muslim festivals include Bakrid, Ramadan and Christians celebrate Christmas and Easter. Economy mainly based on agriculture and livestock. It is also known as "Rice Bowl of India & “Egg Bowl of Asia”. Kuchipudi is the state's best-known classical dance form. Others are Kuchipudi, Andhra Natyam, Bhamakalapam, Veeranatyam and folk dances (Janapada Nrutyam) forms such as Butta bommalu, Tappeta Gullu, Lambadi, Dhimsa, and Chindu. Tirumala Temple, Simhachalam Temple, Srisailam temple, Buddhist centres at Amaravati, Krishna Wildlife Sanctuary, Indira Gandhi Zoological Park, Pulicat Lake Bird Sanctuary. Previous Story Would you like to know these Twenty facts about Chhattisgarh?